Durable - use again & again! I love these bamboo drinking straws. When they first arrived, I wasn't so sure as they have a different mouth feel than plastic straws, but the longer I've used them, the more I like them! These aren't "made" from bamboo, they are real whole bamboo stalks – nothing re-compressed or processed. And now they are even more smoothly finished with wider holes and fewer irregularities. They're better than ever! 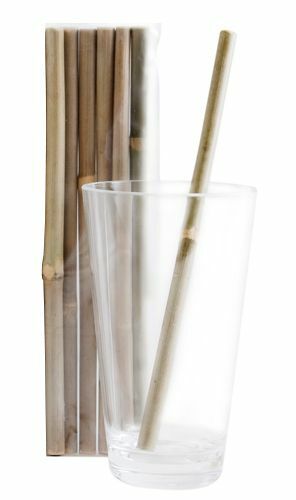 Bamboo drinking straws are a fun and eco-friendly alternative to plastic that can be used with any beverage. I love drinking my KT with ice and a splash of water with this straw. Plus I feel good knowing that these are 100% wild sourced, organic, compostable, and bio-degradable. Hey did you know - 1 billion plastic, petroleum-based, non-biodegradable straws are used everyday worldwide! Egads - that's a whole lot of garbage being generated that is going to take years to break down in the land fill. A purchase of bamboo straws is a vote for sustainable materials. Each straw is 10 inches in length and will last for years and years when properly cared for. The free cleaning brush makes the maintenance even easier. Want super durable and stylish Stainless Steel Straws instead? I have purchased and used both glass and stainless steel straws, wanting an alternative to plastic, but they are both too hard on my teeth, and actually seem dangerous. I love the look and feel of these bamboo straws, I only wish that the flow rate were more consistent. Since they are naturally formed, some are too thin for my taste, others are just right. These are very cool straws and the hole is larger than I expected, but that's not a negative because it's easier to clean! Thank you for offering these unique straws Hannah! I absolutely love these bamboo straws. I was concerned about tooth sensitivity from the Kombucha and this solves the issue. I also like that it has the right height for sipping out of a bottle. I will definitely be recommending these to friends & family! I love that they are made out of bamboo! I really worry about using plastic. And they are nice and long, making it easier to test my batch. Easy to clean. Great value! I bought two packs for the price break! The rims on these are nicely finished to be easy on the lips, and they are overall much higher quality than I was expecting. Even the inside seems smooth and is easy to rinse out. I like the fact that they're so strong; drinking really thick stuff is a non-issue. Great product, so much cheaper and stronger than glass straws! My kids fly through straws so I was excited to see these reusable bamboo ones. They're obviously larger than a normal straw so it takes some getting used to. The hole size varies too but I've had no issues drinking my thick smoothies in the morning. Only problem I've had is the kids often leave them in a cup of water and I find it hours later. But so far no damage done, and they clean up quite easily. love these straws! I was so happy to find an alternative to plastic straws!